Since 1975 Schischek has supplied electric explosion proof products worldwide for heating, ventilating, air conditioning for industrial and offshore applications. Schischek explosion proof protection has become an important partner for consultants, public authorities, control companies, installers, O.E.M's and not least, the end user. As component suppliers we have always considered it our duty to develop products in conjunction with other control equipment. Modern Ex equipment -reliable, proven and with the latest technology. 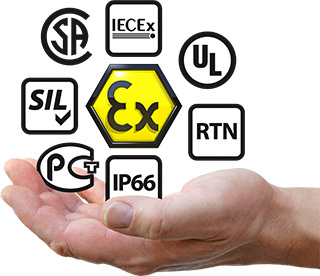 Safety is essential – With this phrase, we want to say that explosion proof protection is not a question of statistics or half hearted solutions but 100% safety must be guaranteed, because „only a little Ex protection“ is not possible! Explosion proof means taking responsibility. People have confidence in us as the Ex protection specialists and in you as consultants, installers and contractors. All Schischek Ex products are therefore PTB certified, approved by and produced according to the very latest standards and regulations. According to type and kind of protection, our products are suitable for operating in Ex areas, zones 0, 1, 2, 21 and 22, including gases, vapours, mists and dust. As main specialization full-service oilfield supply company AZ Supplier offers distribution services for all products of Schischek in territory of Kazakhstan.